I got hold of a electrical instrument cluster / digital speedometer for my minivan. Its from a 1995 Chrysler Town & Country. I built the Body-Controller and the instrument cluster it into my 1994 European Version Minivan, and it worked like a charm. The mileage of the Vehicle with a digital speedometer is stored in the body-controller, that is what I know for sure. With the mechanical instrument cluster the mileage is not stored in the body controller. Both body computers have the same housing and you can see the same Part numbers on the circuit boards. 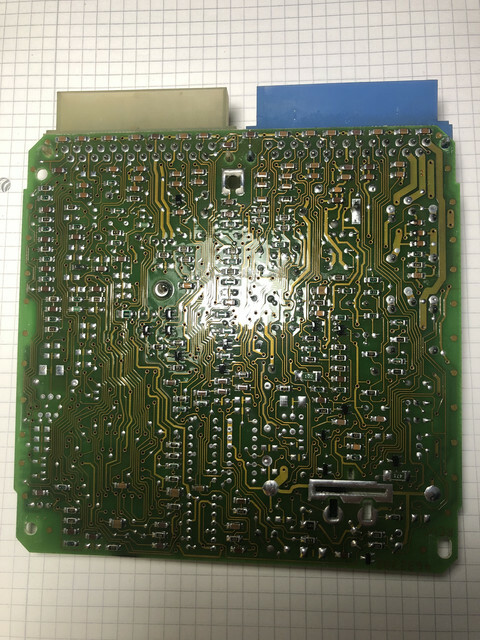 The Part Number on both circuit boards is 4632382 REVC . So my problem is the cool nice looking digital cluster shows the wrong mileage since it it from another vehicle. I guess there should be some kind of way of changing the mileage, but how? I cannot find any bit of information on the CPUs since they are most probably custom made from Motorola for Chrysler. I would be very thankful for any bit of information on these Electrical Instrument Clusters, since I can't find any information. I *think* A Chrysler DRB-II can access this. I'm fairly sure no other tool can do it. IIRC, at some point someone was programming odometer chips for sale but I have seemed to misplaced the url. I have a DRBII, i will Check and Post the result. I was in the workshop today and used the DRB II. I used the "DRB II Super Cartridge 1983 - 1994 (V8.0)"
I sat there quite some time and looked through all the menus but could not find anything regarding the mileage. There is an Adjustment - Sub-Menu in which Auto-Lock or a Indicator Chime can be Aktivated or deactivated. I did not see a possibility to see the mileage with the DRB II in the Body-Controller submenu. No possibility of seeing or changing mileage. I tried another Cartridge "Mopar Diagnostic System Level 2.05 1992"
nothing to see there...since I don't have access to A Mopar Diagnostic System that doesn't help. Disconnecting the Body Controller results in no mileage showing in the instrument cluster. I am certain the mileage is stored in the body controller, not in the instrument cluster. The mileage is stored on the BCM. To my knowledge, there is no way to change the mileage via the DRB II. Furthermore, the BCMs were not available to purchase for digital dash vehicles. In the parts manual they simply said "Return Center". They were probably sent to Chrysler and they would re-program the mileage on it for you. This controller-situation is not yet out of my mind. Since the 68HC11 CPUs also came with integrated EPROM, I strongly believe the code is inside the Chip (duh, where else should it be). I am not sure about the Pinout of the CPU, so is don't know where to hook up the Serial Com, to bootstrap the Chip. I also could not find any information for the ICs on the board. For the Signetics there is an old thread here, without a solution. Also, there is no dedicated CCD Chip like the Harris 4374040, Intersil 68HC6811S or Philips 4651148. CCD bus communication must be integrated into the CPU. My SBEC II modules also don't have a dedicated CCD Chip, so it is probably also integrated in those CPUs at that time (1990-1995). Edit: How do I properly post pictures? Last edited by Mr. Minivan; 01-29-2019 at 11:19 AM. From 1988 to about 1994 the mileage was kept in the SMEC etc. to verify the mechanical odo. reading. The primary reason was so warranty reps could confirm mileage if the displayed mileage was suspect. A DRB II could access the reading and even alter it to match the the mechanical odometer if needed. A local guy who "adjusts" odo's said from 1997 minivans digital odo reading was controlled by the "computer". I never thought to ask about 1996 and earlier. He also said the BCM reading had to match the odo reading for the vehicle to operate properly. EG: Security system activated if readings didn't match. He also said with some vehicles like the Neon and PT Cruiser the cluster controlled the reading. i don't know about the SMEC and can't test it because I lack a car with the module, BUT I am pretty positive the SBEC/SBEC II from the minivans do not hold information regarding the mileage. I don't know about any possibility to change the mileage in a SBEC with a DRB II. The next time im around such a vehicle I will definitely check this out to verify this with a DRB II. Since the dash shows the mileage from the BCM this feature does not exist in the Gen II minivans then. Without the BCM there is no Mileage shown. Just an asterisk. Is there any kind of cross-reference possibility for the Motorola CPUs regarding the Chrysler CPUs? This is an extremely far shot but I think I might be onto something regarding the CCD chips in general. Signetics was bought by Philips 1975. So Signetics and Philips could have shared resources with each other. Both controllers are from the same vehicle, what do those controllers have in common? They both control I/O and have a CCD BUS connection. What do they also have in common? A Signetics 4632650-1 Chip! Incidently this chip is a SOIC20 package. What is also a SOIC 20 package? A Philips 04833637 and a Philips 4651148, both of which are CCD BUS interface chips. The Intersil CDP68HC68S1M is also a SOIC 20 package, which is definelty a CCD Chip. 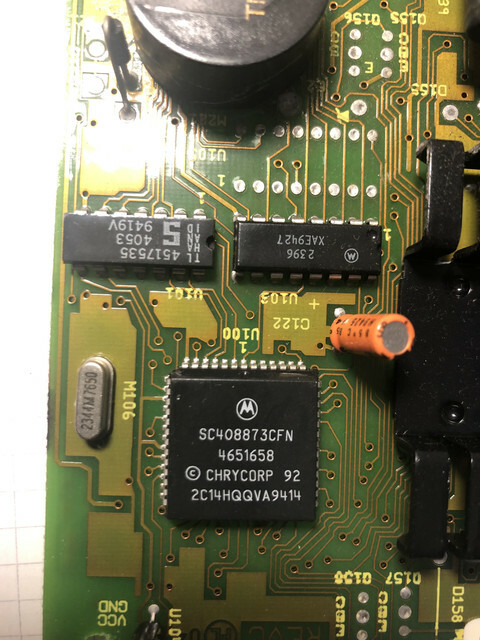 So maybe, maybe, maybe the Signetics 4517535 4053 9419V on the Body controller is a CCD Chip. It is a DIP14 package, so is the CDP68HC68S1. On the mechanical dash there is no Chip found anything close to the other chips mentioned. I traced the CCD inputs on the Dash and they run through a few resistors, diodes and stuff and then go directly into the CPU of the mechanical dash. MAYBE because the dash never writes to the CCD bus, it only reads and shows values. So why implement a chip for writing, its a waste. It also looks like the Dash provides the bias voltage needed for the CCD Bus. The digital dash does have the Harris Chip. Maybe development was not so far? 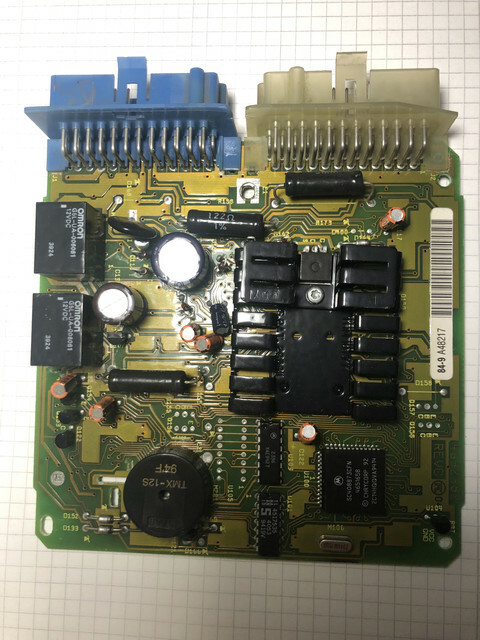 The digital dash has an extremely rough PCB, it looks like it was modified and carried over from the 80s, so the CCD chip was kept. The mechanical dash looks much more refined in the way of design, so maybe it was a clean sheet and they just left the CCD Chip away. A lot of maybes, but the picture seems kind of reasonable. Last edited by Mr. Minivan; 01-31-2019 at 01:06 PM.